Having issue with 100% stress? Your dupes keep crying, vomiting, destroying and eating all of your food? Fear no more, I'll help you make them happy! Right now, stress is one of the biggest challenge in the game, especially during early-mid game. 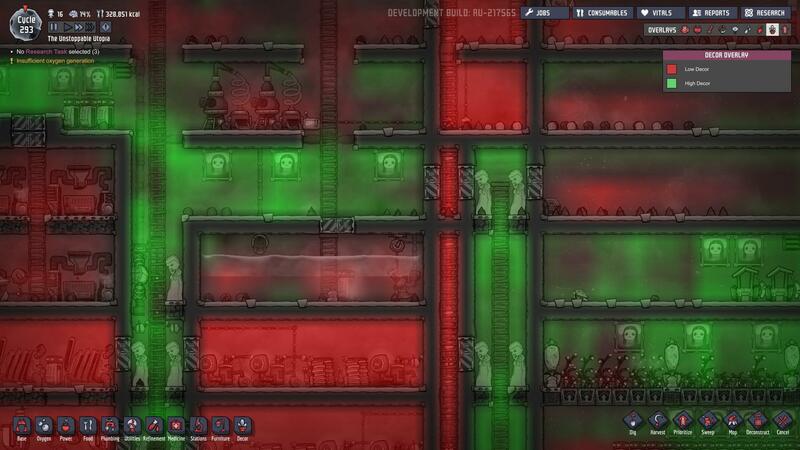 After you manage to overcome oxygen and food issue in your base at early cycles, soon you will have to deal with stress. And building lots of massage tables isn't the best solution. A happy dupe is a productive dupe, ignore it and you will pay for its price. I will sometime mention number and percentage in this guide, but be aware that it can change during the development for balancing purpose. This is Alpha Release after all. It's high likely that some of the patch will change the number. Before I explained further about how to manage your dupe's stress, I will explained stress responses first. Stress response are how the dupe will react when he/she stressed out (i guess around above 60-70%). Currently there are 4 types of Stress Response. Dupe will vomits, means he/she will produce polluted water. Side effect: reduce their callories (make them hungry) & soggy feet debuff (produce more stress to those who step on polluted water). Side effect: Dupe cannot perform repair job, means he/she can't repair broken stuff & broken building/machine will stop working and require another dupe to repair it. Which mean it will cost time & resource (material/metal). IMO this is the cutest stress response in the game :) Dupe will start sobbing and crying from time to time. Side effect: Produce negative decor around them (sorry, i never check how much is the negative decor. will check later). Negative decor can produce more stress to the surrounding area. Dupe will eat a lot of foods in order to reduce their stress (again, sorry i don't check how much they will eat in callories, because this has been change before). IMO by far this is the worst stress response in the game right now, i recommend you to avoid this if you are new player. Side effect: They can eat your whole food stock, which can trigger starving issue in your colony. 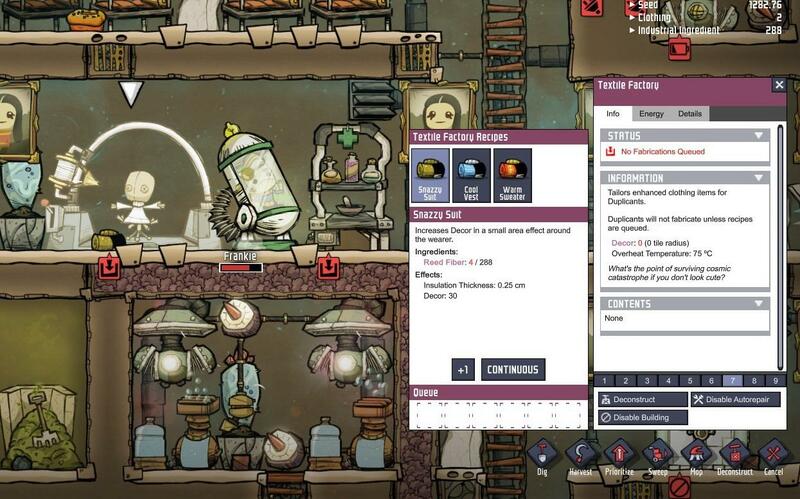 Starving dupe will produce more stress and can be the start of snowball effect that leads to your colony doom. Open Vitals window and see/sort their conditions. Look who has high stress and click on their name to open their info status window. Red status means there is negative effect (stress or attribute). Hover your mouse over to see what it does. You can also hover to their stress conditions and see what causing positive & negative effect to their stress. After knowing this, try to eliminate all of their negative status (you can ignore grimy & dirty hand). This is one of the basic solution to deal with stress. Every dupe has expected decor. It's simple, everytime dupe(s) stand in a place that has higher decor rating than they expected, their stress will be reduce by 20%/cycle (number might change in the future) and vice versa. So.. Decor all your colonies with painting & sculpture.. Turn your colony into art museum and exhibition. Light also provide decor rating, but it's not that worth it right now, they require power and the area is not that large. Painting & sculpture are good enough (better). Good food is good mood, feed your dupe(s) with high quality food to reduce their stress. Similar to decor, dupes also have expected food quality. Watch their expected food quality and manage them in the Consumables window. This is related to decor rating, you can assign clothing to each dupe. By wearing a certain cloth, it can buff the decor rating in surrounding area. Currently, this is the only building in the game that can fight stress directly. Who don't like a good massage, eh? The thing is, you should build some but avoid using it. By using the massage table, it cause your dupe to stop working and just idling there in the table. And what makes it worst, they also consume power, by a lot.. 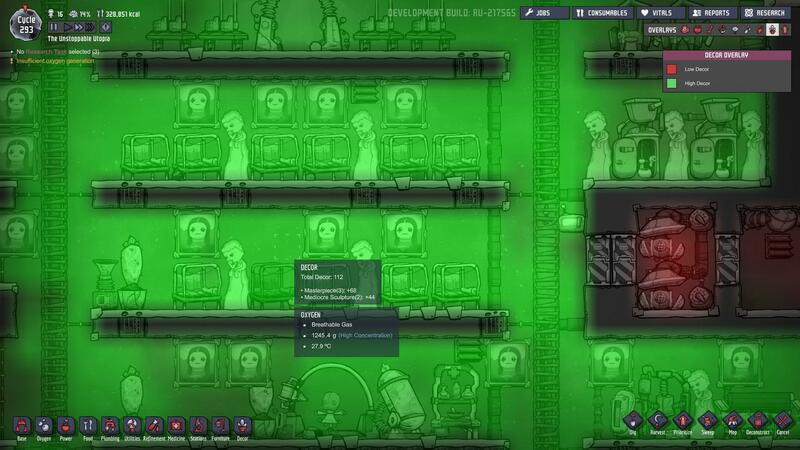 If you are still using hamster whell (manual generator) as your main power supply, this means at least 2 dupes are being occupied to deal with the stress. This is holding back your colony progression. And it is kind of stupid if both of them are taking turn to use both the massage table and manual generator, never ending loop until they run out of food & oxygen. While eating in a table, they will reduce the stress by a little. This can be useful if your base is small and they are not exploring too far from the base. I used to build these before, but since it locked dupes to eat in the table, i don't use it anymore. When your base is large enough that it can take them 1/3 or 1/2 cycle to walk around. 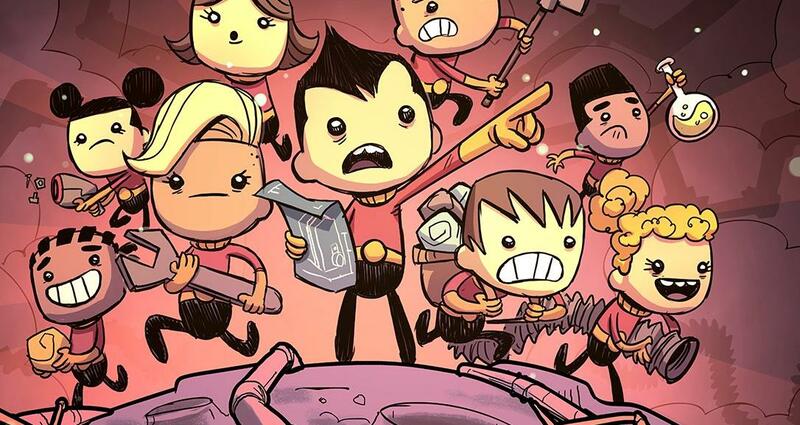 making them go back to your base to eat lunch/snack is super wasting time. 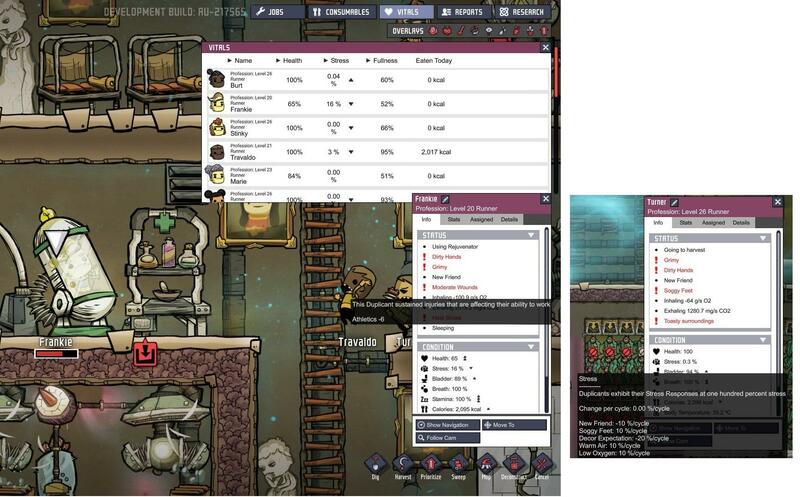 So instead of building mess table, you better create food storage in several places and let them eat there. Decor expectation increase each time a dupe gain level. Max Decor expectation is 50. Food expectation also increase by level. Max Food expectation is 0 (standard). Picking duplicant that have high creativity is a good thing once you ready to create painting & sculpture. Raising creativity level is quite hard since they are rarely being use, so picking duplicant that already posses high creativity is quite useful. They can paint/sculp faster and create higher decor rating when done. Side note: you don't need to pick one right away in the 3 first dupes. Watch for building information. Learn which building is producing good & bad decor. Watch their temperature too. Being in cold/hot area can produce stress. Keep your oxygen pressure high. Low pressure causes stress. Mop your floor clean (from water & polluted water). No matter how small it is. Wet floor trigger bad status (produce stress). Be careful when managing their consumable list. If you can't afford high quality food, it's better to let them eat bad food instead of starving. Be careful not to set your massage table to high/low. Especially when you have a lot of things to do. I usually set it to 0-50% or 10-55% in early/mid game. Shower is not really needed, i recommend to avoid building it until late in the game. Shower is good to remove soggy feet & sopping wet, also make the dupe less likely to catch sickness. But it took times for them to take shower and sometime make them walk for half a cycle just to get there and being interrupted while showering. Right now the mechanic is a bit broken and need fixing. Same thing with Hand Sanitizer, not really needed. Be careful with bleach stone, it produce chlorine. Decor their room & corridor where they usually walk and do activities (especially their bedroom). It's possible to have low stress without having to use massage table. Some dupes will still have high stress because of their job. Like for example Frankie is working near a geyser and he is being hurt by it (Heat Stroke). It's normal to have this kind of thing. No need to worry, just let him rest in the rejuvinator.